Do What I Say…. Not What I Do! This weekend I taught a fun new class which combined basic metal work with stamping and soldering, to create a personalized heavy gauge ring. I don’t always get to create a complete project in class, because I am focused on working with my students, but for this project, I had to demo every step, so I was able to make a ring of my own. So I decided that the chemical compound for CAFFEINE (C8H10N4O2) would be kinda cool. I showed the class how to line up the letters, and I even told them that they need to watch for the direction of the stamp, so that no letters were upside down. So what do I do?! I proceed to stamp the “O” sideways… obviously I needed a little bit more coffee before class started! 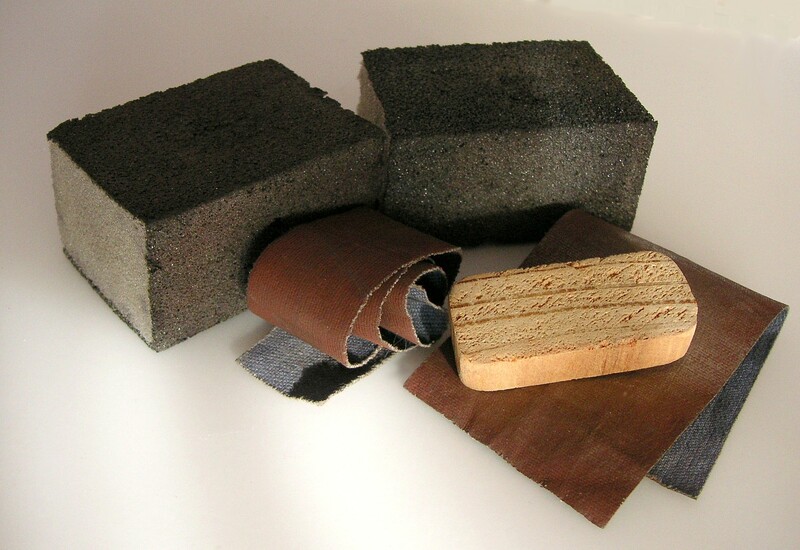 So this became a lesson in “organic design” – sometimes you just need to accept your design, flaws and all, and love the uniqueness of what you create. And… the class decided that my representation showed a quirkiness that works! 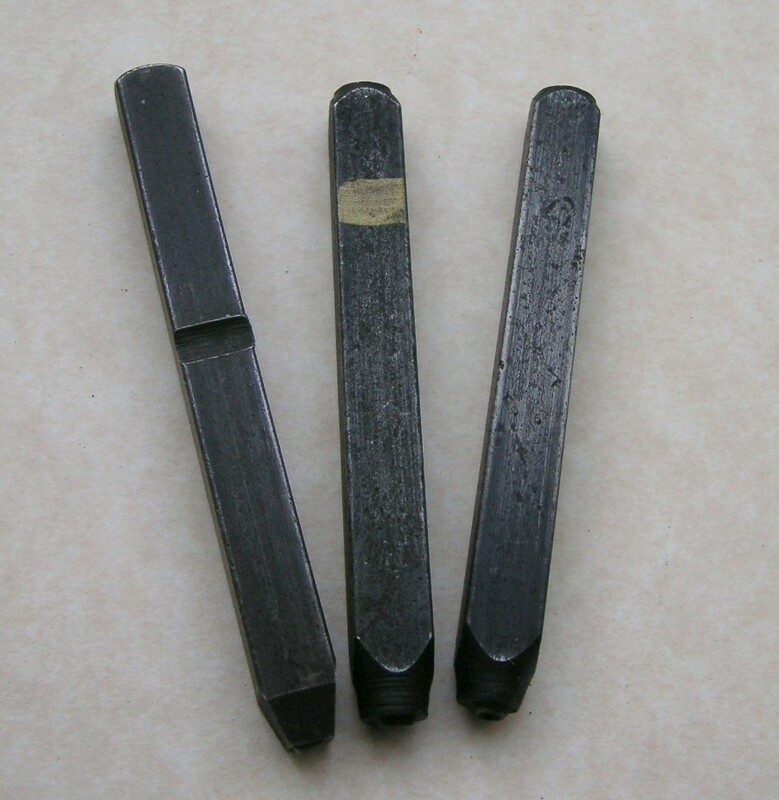 Some letter stamps come with a scratch, or a mark on them, indicating the side that faces you when stamping, so that the letters line up correctly (example above left). The stamp set I used for my C8H10N4O2 ring didn’t have any markings, so basically you need to check each letter before stamping. Obviously, I got it wrong! 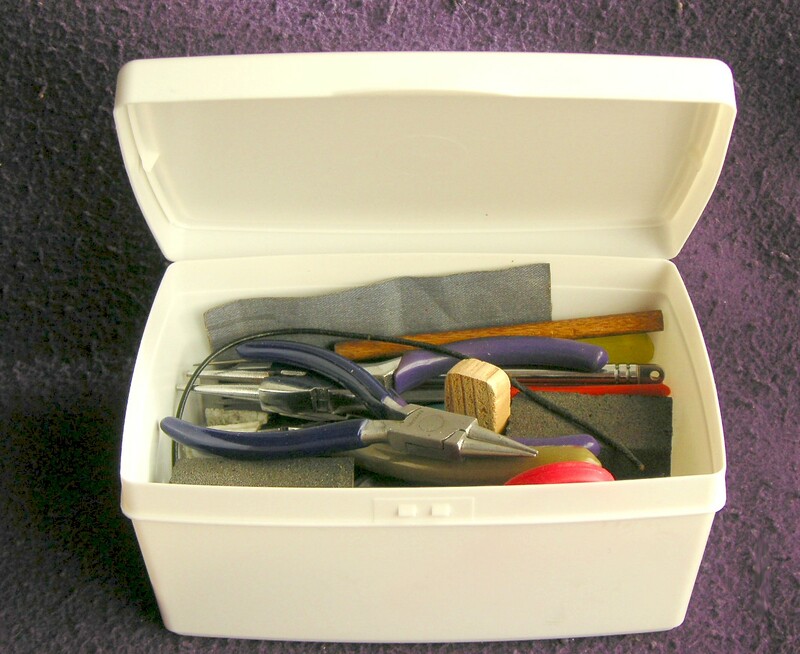 A simple tip… if your letter set does not have any directional indicators on them, then I suggest marking it yourself. I use a little nail polish (example above center) which shows up and withstands a bit of abuse. Because if you leave your stamps plain, like the one in the photo above right, you will surely create some “organic” designs yourself! This design was a great accident – nothing like what I originally started out with, but the end result came out great! 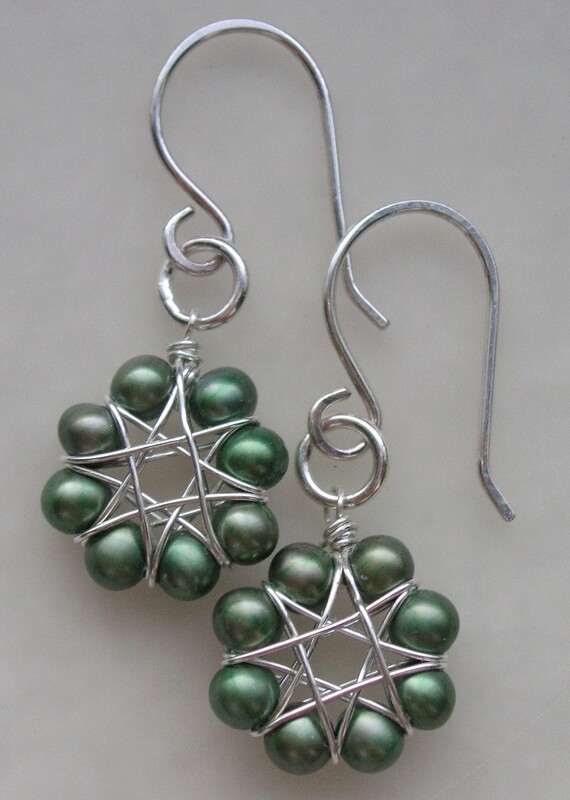 These earrings are pearl and silver, but I’ve adapted the “Celestra” design to create a larger wired gemstone component for a pendant. I really enjoy creating class projects for beginners that go beyond the basic “how to wrap a loop.” It is vital that you learn the basic techniques, and learn them well, if you want to continue creating jewelry. 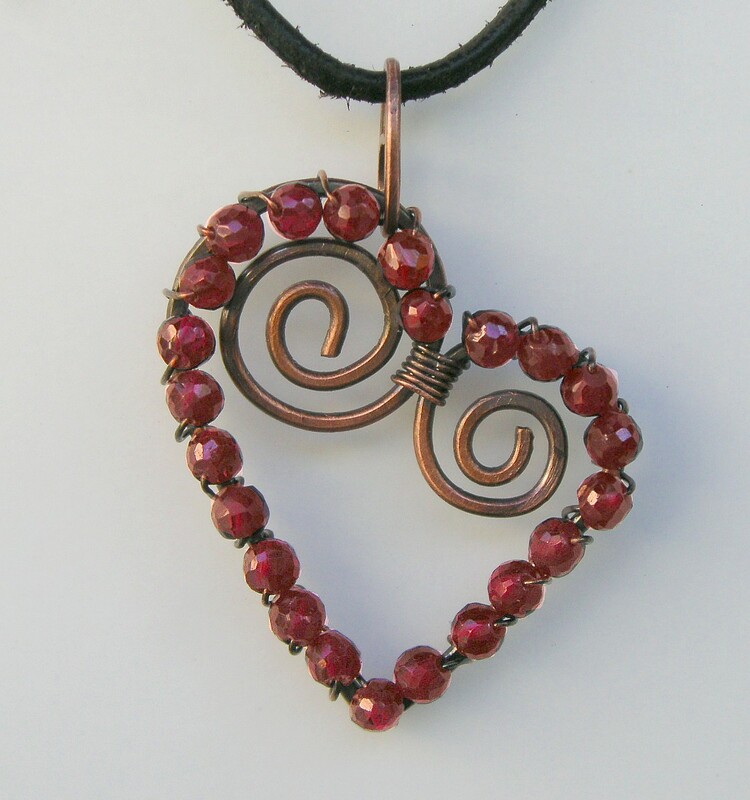 But I think that if you can walk into a class knowing nothing about wirework, and walk out with a very cool project, you will be more inclined to take a few more classes – and that’s my goal! 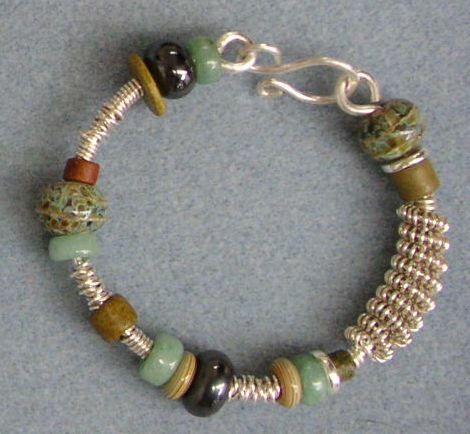 This weekend I had a really great class – a great fun project, alot of different wire techniques, beautiful beads, and just absolutely wonderful students! In my class yesterday at Beaded Bliss (one of my favorite places! ),the students created such great projects – I decided that this week I would focus on them, instead of me! 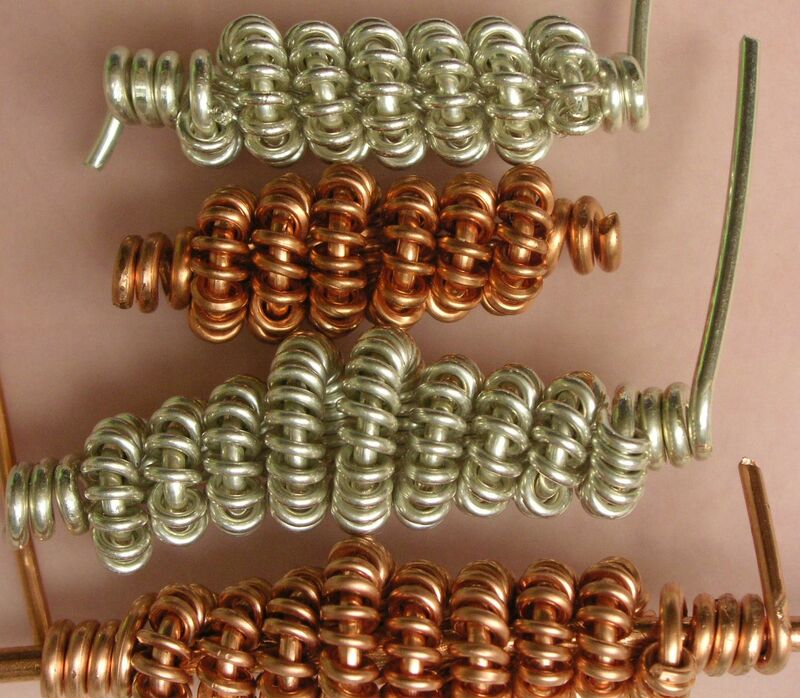 Some folks used silver, but some decided to use copper instead, especially folks who were new to wire working. No one wants to spend big $$ on silver when you’re learning new skills, and aren’t sure how it will come out. 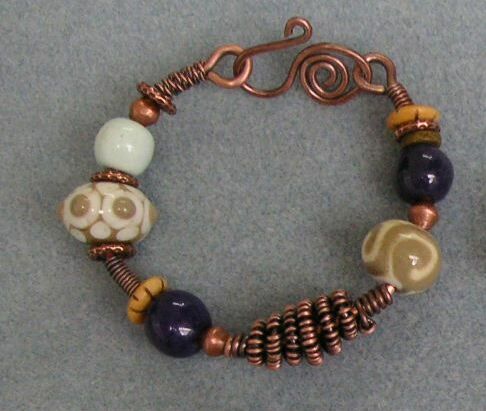 Once we mastered basic coiling and twisting, we learned how to make Kuchi beads from wrapped wire. I’m not sure where the name “Kuchi” comes from, but that’s what I’ve always heard them called. Antiquing makes it come to life! Everyone made up a nice selection of coils and Kuchi’s, and then those wanting to antique them, gave their components a bath with Liver of Sulpher (LOS). 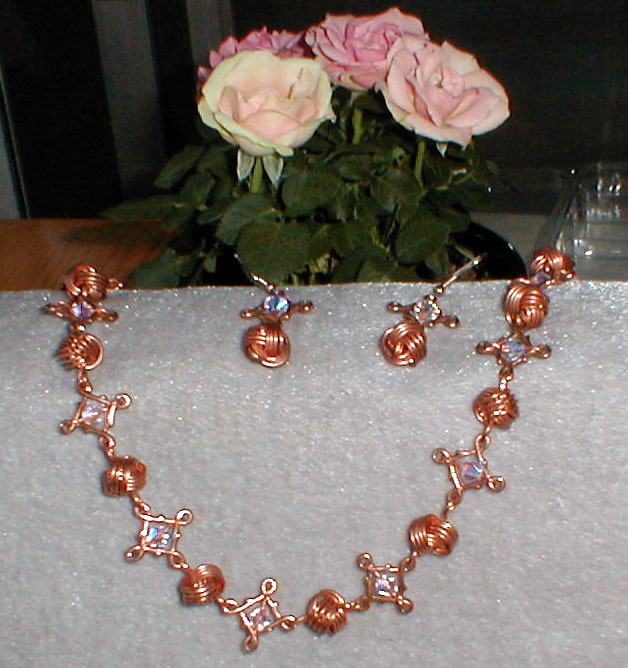 I love how copper gets such a rich look from the LOS – it changes the wire from “hardware looking” to jewelry grade! So what was everyone making….? 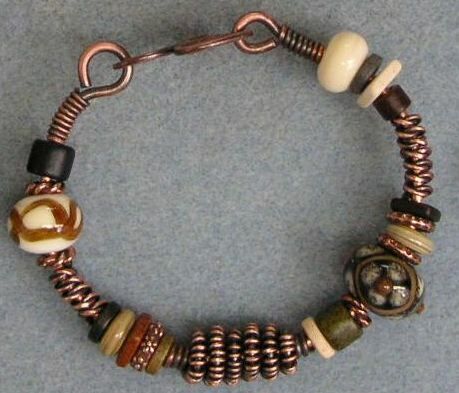 They combined their wire components with some beautiful lampwork beads, natural stones, and a variety of metal, bone, glass, and ceramic spacers. And they made these beautiful bangles! 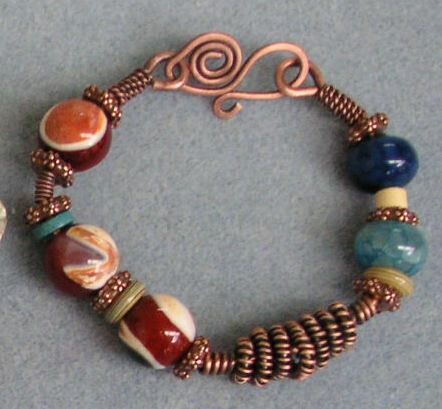 I love how these beads work together – the copper really works with the colors she chose, and the end result is a beautiful bracelet. Aren’t these cool beads? The carnelians have some real unusual patterns, and they are balanced with the cool blue beads, and tied together with the cream accents. Another beautiful bracelet. The beads and spacers in this bangle really work well together – the group of spacers next to Kuchi show such a wonderful variety of textures – when they are all together, they become a subtle focus. 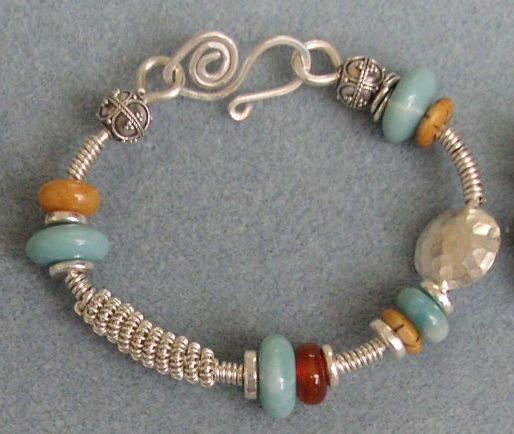 This is a great bangle… the blue beads are amazonite, and they look fabulous with the carnelian and bone beads. The silver work is really well done – the very precise Kuchi and tightly wound coils provide a very clean look. The decision to leave this bright (not antiqued) gives is a wonderful light feel. This bangle reminds me of the African Savannah! 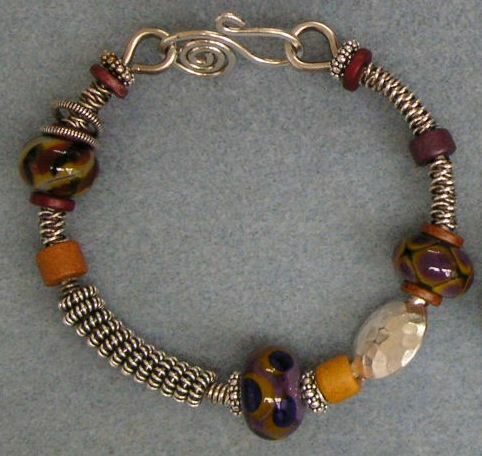 The colors, and the patterns on the lampwork beads – they look great with the antiqued silver wire, and ever time it moves on the wrist, you see something new – what a different look than the first silver bangle! 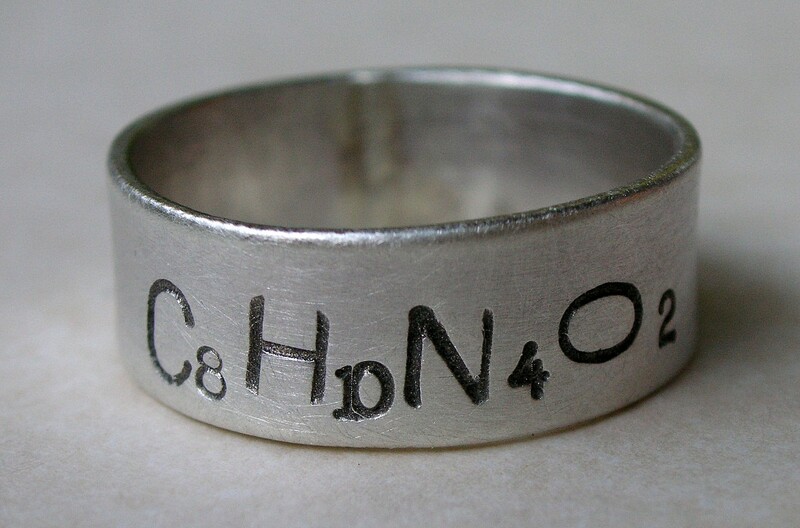 I never forget that students take classes for a number of reasons – they want to be among people who share their passion, they want to learn how to do something, and they hope to walk away with a new skill… and hopefully a great new piece of jewelry! I was really thrilled with the amazing pieces everyone created, and I think they were too! 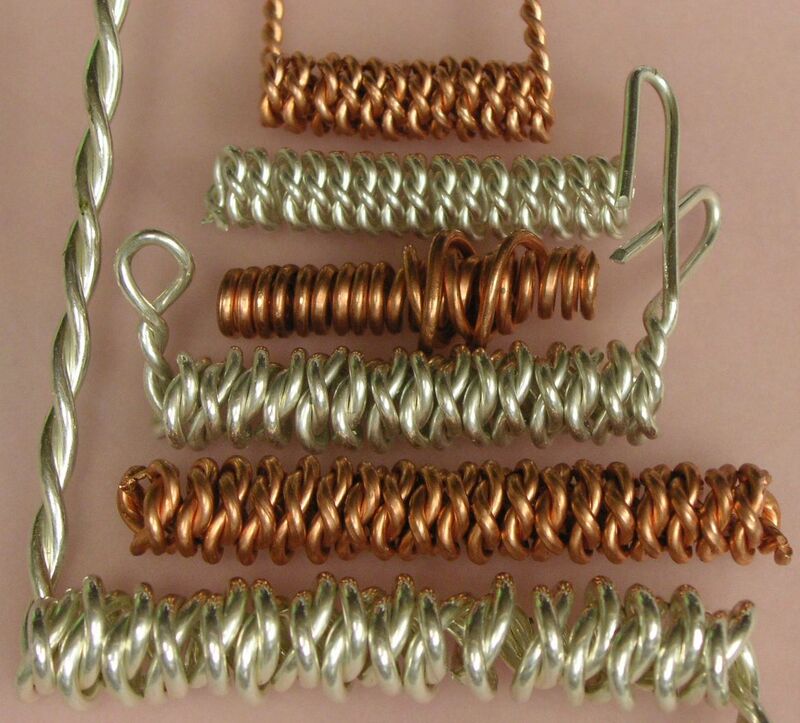 … just some ways to have fun with wire! I love how wire can be manipulated, and adapted for so many different looks. 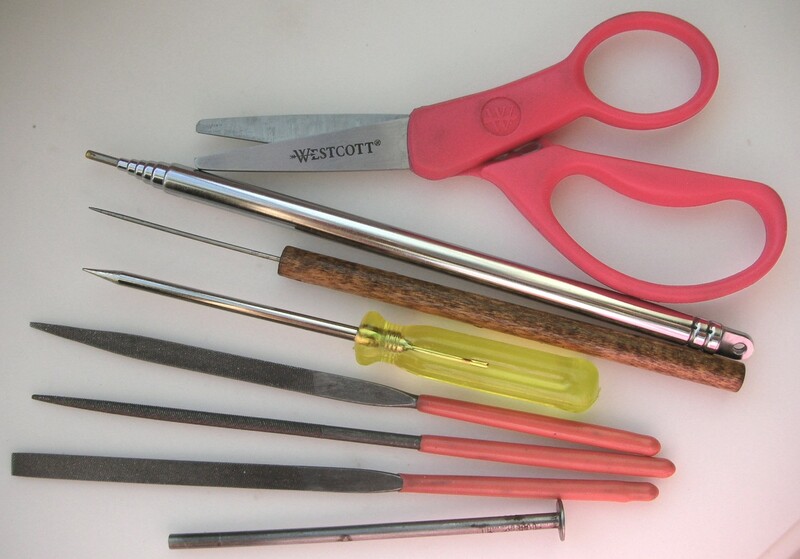 Basic wire skills are so important – knowing how wire bends and acts are key techniques that every jewelry designer should know. 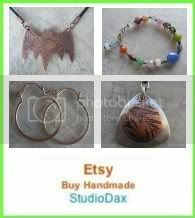 But wire work is so much more than wrapping a bead or making an earwire! 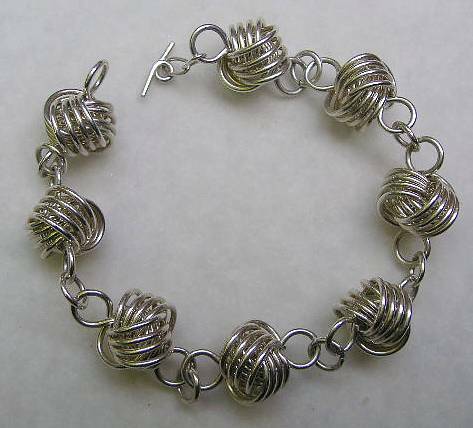 Wire can be a key design element in your pieces – not just an accessory to beads. 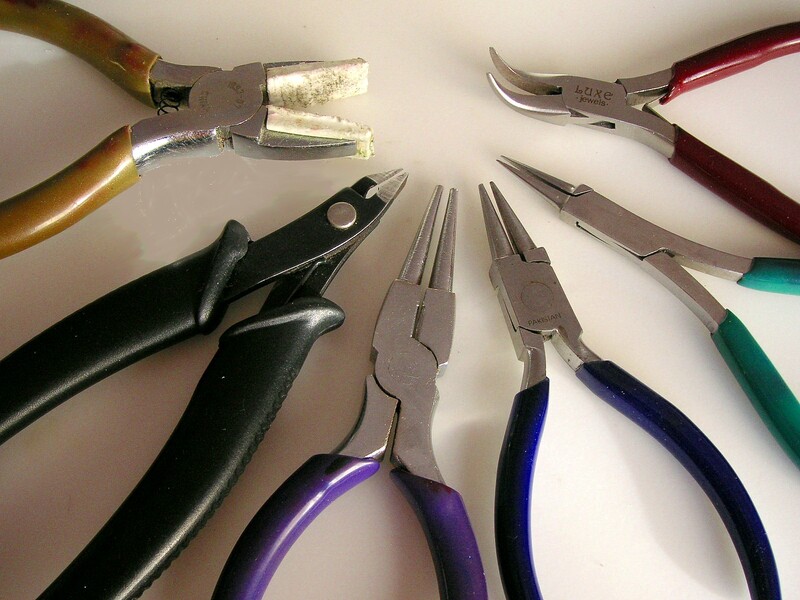 Luckily, some of of the best wire designers in the country are also some of the best teachers! For those of us looking to broaden our wire skills, Hooked on Wire (Sept 9-12, 2010) is a great venue to meet up and learn from the masters! Isn’t this just a gorgeous necklace!? Barb is such an artist with wire… I love how the focal rivoli crystal and the antiqued wire are used – it reminds me of flowing vines and flowering English gardens. The inspiration for Lisa’s fabulous bracelet is old style iron gates… in this detailed close-up, you can see how the scrollwork inspired a new art form as it wraps around your wrist! These workshops teach you so much more than just the projects… they teach you the the techniques. This is the 7th year that Hooked on Wire has brought such talent together, and it’s a great opportunity to meet up with others that share your passion. If you’ve never attended a retreat like this, think of it as both a vacation, and an education… your creativity will thank you for the kick!! And I’d love to meet you too – I’ll be there, teaching “FAN-tastic Pendent,” one one of the optional night classes, so make sure you check out the entire Hooked on Wire site to see how much fun you can pack in just 3 days!